There is a 107% chance that my kids will have already figured out what's inside each of their stockings before Christmas morning...or at least they'll know 4 out of the 6 items stuffed in there. To be honest, guessing their stocking gifts ahead of time doesn't really require my kids to do much sleuthing. I'm a creature of accidental habit. I do something once, find success at it, and then continue to do the exact same thing until the end-of-time because as the old adage goes, "If it ain't broke..."
My stocking stuffing procedure has been on permanent repeat for as long as any of my clan can remember. The other two gifts remain on lock-down until Christmas morning. They are the wild cards--the mystery items that everyone looks forward to opening. Since I stick to a pretty tight, debt-free Christmas budget of $60 a child and since I have no desire to buy cheap toys and trinkets that will break or get tossed aside, I'm very purposeful in my purchases. I'd rather use my pennies to buy intentional gifts--fun toys that will not only breed delight but also learning in my home. Here's a list of my favorites. At the time of this post, they are all under $10. 1--Letters to Me When I Grow Up// Your kids won't even realize they are practicing their letter writing skills with these bad boys. 2--Make-a-Face sticker pad// Sticker pads help develop the fine motor skills and hand muscles that your kids need for handwriting. 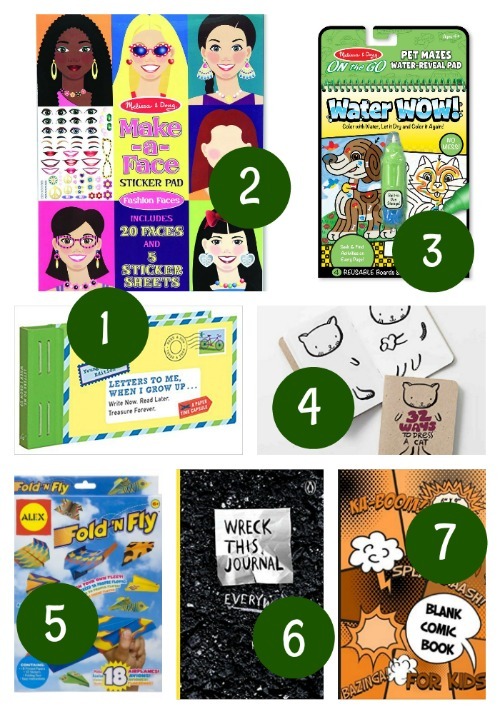 3--On-the-Go Water Wow activity pads// Water Wow notepads are great GO TO quiet activities for little ones who have trouble sitting still during sermons on Sunday. 4--32 Ways to Dress A...sketching books// These notepads are small enough to slip into your purse. Bring one along the next time you're going to a restaurant or doctor's appointment. 5--Fold N Fly Paper Airplane Kit// My kids constantly ask me to help them make paper airplanes out of scrap paper. They've still not realized that I don't know how. 6--Wreck This Journal// Have you seen these? There's an entire series of them. If you have a child that hates to write or struggles to read, buy one of these journals. Trust me. 7--Pocket Comic Book Journal// Reluctant writers are always more prone to write if they can do it in short snippets. Creating comic strip narrations is a non-threatening writing project for anyone. 8--Geyser Tube with caps// These can be too much fun--even for moms! 9--Tornado Tube bottle connector// My budding scientist borrowed one of these from a friend and played with it non-stop for weeks. He's getting one of his own in his stocking this year. But let's just keep that between you and me, shall we? 10--geodes// If you prefer not to purchase the entire box set that comes with goggles and other small tools, just grab an individual geode at a gift shop. They're usually only a couple of dollars. Good luck wrapping it, though? 11--owl pellet with bone chart// Admittedly, animal vomit doesn't sound like a great Christmas gift, but it is! Just ask my boys. 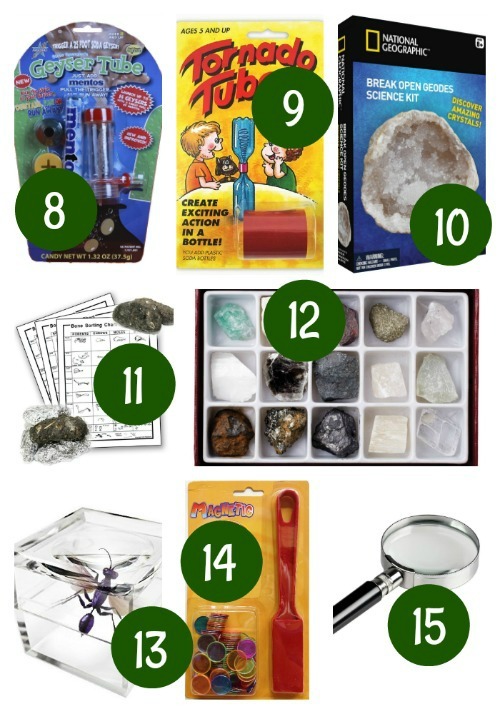 12--mineral kit// These make great starter kits for budding rock hounds. 14--magnetic wand// Don't just limit your stocking gifts to magnet wands, though. Buy each of your kids a different shaped magnet (horseshoe, disc, bar, ring, etc.) and let the scientific process begin to build. 15--magnifying glass// I've never met a kid who wasn't fascinated by a magnifying glass. 16--Blink// This lightning fast game is great for developing the perception and assessment skills needed for reading. 17--Dutch Blitz// We've played this game so often over the years that our cards are all dog-eared and bent. 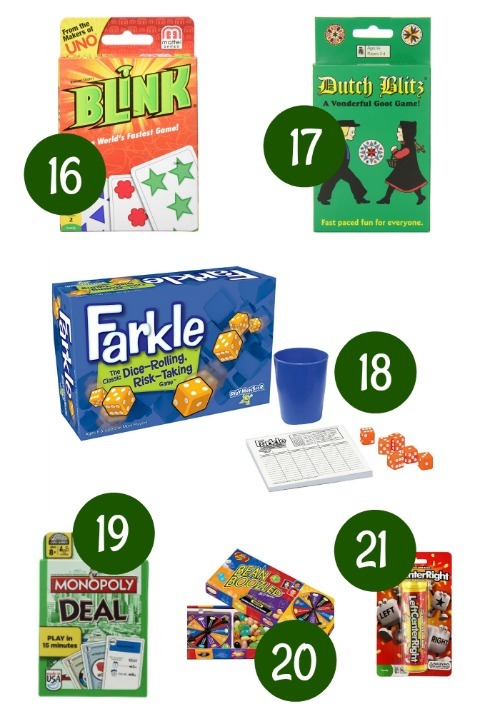 18--Farkle// To be honest, you don't need a commercially packaged game to play Farkle. All you need is a set of 6 dice, a pad of scratch paper, and a pencil. Here are the rules to help get you started. 19--Monopoly Deal// I hate Monopoly. My kids hate Monopoly. But we all love Monopoly Deal so much that we have not one, but two decks. 20--Bean Boozled// This is a great party gift. Play it on Christmas day with extended family or save it for New Year's when you need an activity for restless kids. 21--Left-Center-Right dice game// You don't have to know how to read to play LCR. You just need to be old enough to recognize those three letters. So even preschoolers can play. 22--flip book paper pads// These are small blank pads of paper for creating your own flip book picture stories. 23--Kwik Stix tempera paint sticks// Consider these mess-less paint. They wipe onto paper like a glue stick, but create pictures like a paint brush. Genius! 24--Lolliz gel pens// Writing is so much more fun with a gel pen. 25--Mr. Sketch scented markers// If you're a child of the 80s, you know why these are so fun. 26--Scratch Art Mini Notes// The drawback of any scratch art pad: the little black ink shavings that begin to appear all over your house once your child starts creating. 27--Scratch Art bookmark packs// Art + reading. This one is a win-win! 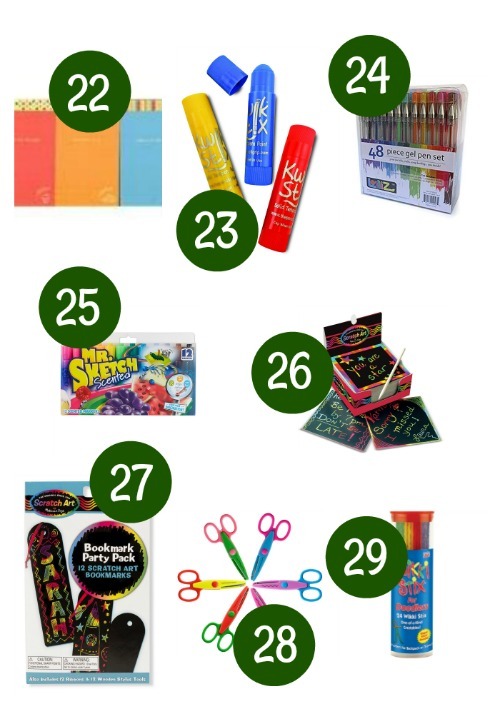 28--patterned edging scissors// Couple this gift with a pack of patterned paper. 29--Wikki Stix// These are the pipe cleaners of the 21st century. They are wax-dipped pieces of yarn and can be reused again and again to create all kinds of simple sculptures. 30--book plates// This is a notepad filled with different sticky-backed name plates. Tear them off and adhere them to the inner flap of your favorite books. 31--Book Darts// These little metal tabs can be used like book marks or as place keepers to mark a particular passage for discussing in a book club or copying into a commonplace journal. 32--clip book light// My older kids often get the privilege of staying up past bedtime in order to read. Small book lights are great for kids who share rooms with younger siblings. 33--iClips book marks// These are magnetic tabs that wrap around a piece of paper and are the best bookmarks ever! 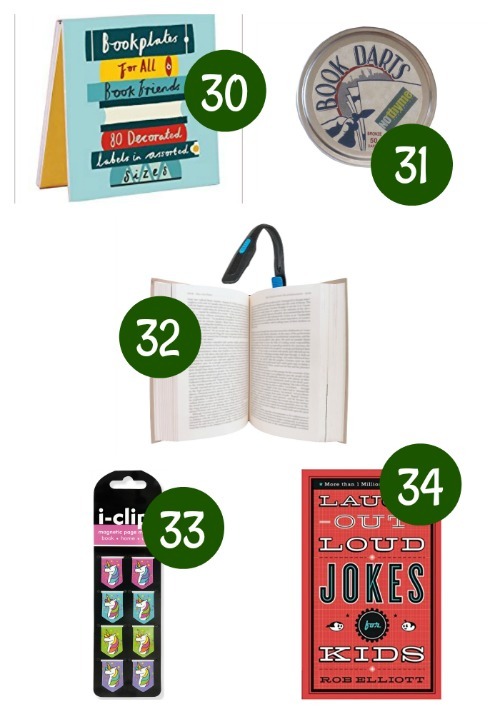 34--Laugh-Out-Loud pocket joke book// Do you have a reluctant reader? Joke books are my secret weapon to get struggling or reluctant readers to practice their decoding skills. 35--party sized Play-Doh// Play-doh is a preschool teacher's secret to building handwriting muscles. 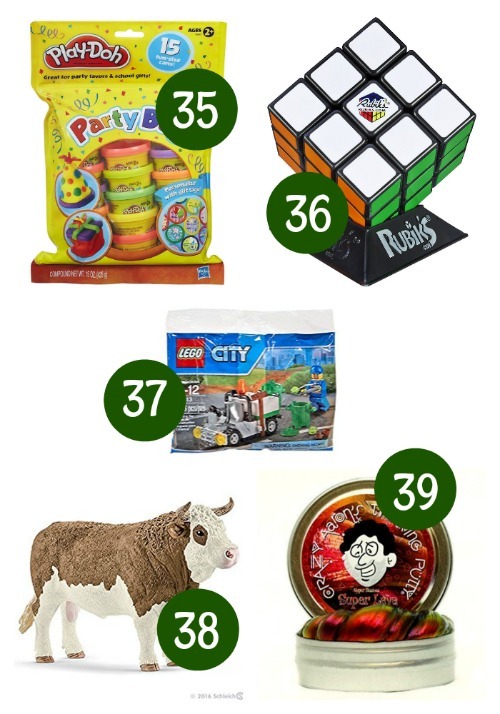 37--bagged Lego sets// These small party-sized sets come in bags and are perfect for slipping into a stocking. 38--Schleich animals// I've bought one Schleich animal every single year for each of my boys since they were toddlers. They are great open-ended toys for imaginative play. They are sturdy and washable. My boys use them outside, inside, in the bathtub...everywhere. All the time. 40--Brick Stix// Turn any Lego Minifig into a soldier, race car driver, fairy tale character, first responder, etc. with one of these sticker packs. 41--bath tub crayons// You don't even need to save these for bath time. The next time you need to occupy your tot for a few minutes, put him/her in an empty tub to draw for a few minutes while you sit close by working on a project or reading aloud to bigger kids. 42--train whistle// Maybe warn your neighbors first before getting this one. 44--astronaut freeze-dried ice cream// While this gift won't last long, it makes for a fun, unexpected stocking stuffer for the kid who has everything. 45--patterned Duct Tape// My son is currently collecting 2-liter pop bottles and duct tape in our garage to build a floating raft for himself. 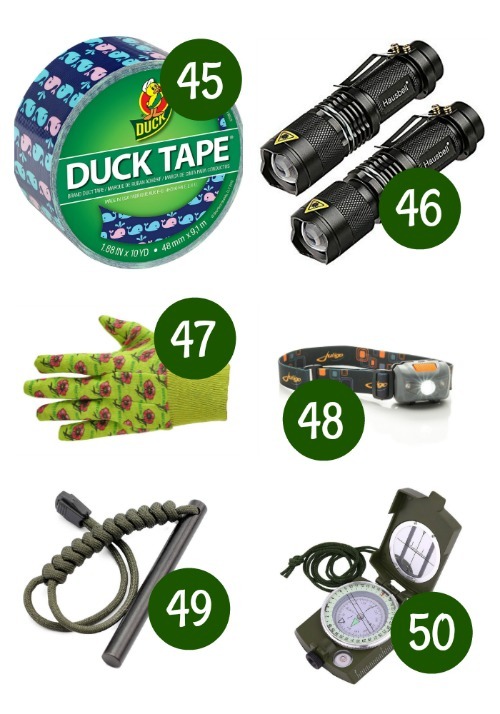 46--tactical flashlight// My two oldest boys will each be getting one of these in their stockings this year. Since the pack contains two flashlights, I'll separate them, wrap them individually, and give two gifts for the price of one. 47--work/gardening gloves// These gloves are the perfect size for little hands. 48--head lamp// Use these outside for evening play or inside for late night reading. 49--ferro rod// This would obviously only be appropriate for older tweens/teens or for upper elementary-aged kids under adult supervision. My oldest son has a few of them and uses them in his bushcrafting club. 50--compass// Don't waste your money buying a cheap compass in the toy section of Target or Walmart. Invest in a real one if you want your child to use it long-term. Thanks! Have a Merry Christmas. Your wrapping paper in the stocking toe is genius! I too, wrap each of my kids' stuff in a separate paper, so this would be so fun for them. It's funny how a piece of scrap paper is the golden item in the stocking every year! I love this post! 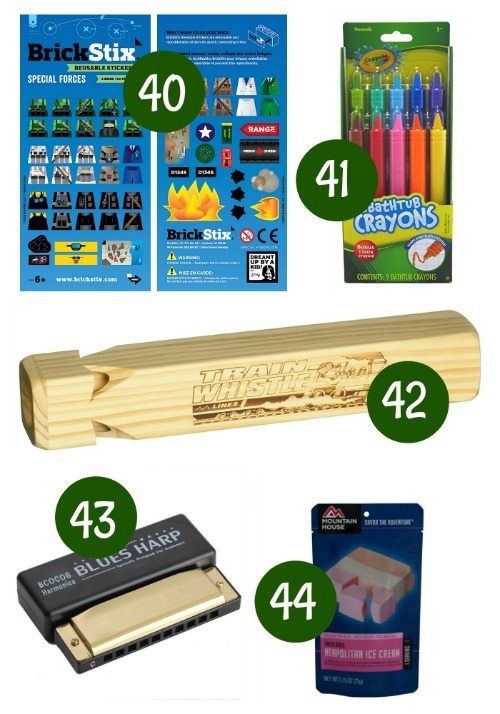 I purchased a few of these things for my kid's stockings, thanks for the great ideas! I am also going to do the scrap paper in their stockings this year as well. So fun! Merry Christmas! I have never seen the Lego stickers before. My kids will love those! They are always wanting to write on their Legos to make designs. I know. Aren't those genius! You can turn any minifig into what you want it to be. What a great list. I'll be sure to share your link on FB.